I truly believe that there are some insufficiently explored ways to understand and ameliorate the problems we have in thinking. We have thought too much in recent years about the science of thinking, and not enough about the art. There are certain humanistic traditions, some of them quite ancient, that can come to our aid when we’re trying to think about thinking, and to get better at it. Jacobs is a distinguished professor of the humanities at Baylor, so you might think he wrote this book for intellectuals or academics. He didn’t. In fact, he argues that “academic life doesn’t do much to help one think” since you become an academic by getting good grades, and you only get those if you say what somebody else wants to hear. Rather, he wrote the book for ordinary people who want to learn how to think, which comes through in its length (160 pages), in its style (though most of us want to write like C. S. Lewis, Jacobs pretty much does), layout (spacious pages, clear subsections, and few footnotes), and most of all, in its helpful content. When reading or listening to something you disagree with, give it five minutes before responding. Give up trying to “think for yourself”; it’s impossible. Instead, belong to multiple communities so that your natural desire to have all your opinions validated by others is gently challenged. Don’t underestimate, let alone try to eliminate, the emotional and relational components of thinking; they’re more important than we realize. Recognize how your tendency to express solidarity with your “in-group” can close down critical reflection altogether. Distinguish carefully between means and ends. Act with the awareness that people who agree with you won’t always be in charge. Choose your metaphors carefully; if you use military imagery for disagreement (won, lost, shot down, demolished, indefensible) or machine imagery for human brains, the metaphors will control your language and eventually your thought. Before you critique another person’s argument, make sure you can express their argument to their satisfaction. Spend more time with books, and less time online. If you want to develop your thinking, develop your character. Some of these suggestions—many, perhaps—might seem like sheer common sense, and they probably are. So why bother reading the book, rather than a quick summary like this? I suggest three reasons. The first is Jacobs’s excellent use of stories to illuminate the complex ways in which people think, reason, and change their minds. Why didn’t Wilt Chamberlain shoot underhanded, even though he knew his free-throw percentage would improve if he did? How did a member of Westboro Baptist Church change her mind? What was happening under the surface in the responses to Ta-Nehisi Coates’s essay on reparations? How did Leah Libresco convert to Roman Catholicism? What is life like for a person who can’t feel fear and has to rely on reason to avoid danger? Jacobs’s stories are harder to summarize than his imperatives, but in the end they’re much more enjoyable, and much more useful. The second is the superb range of writers Jacobs summarizes in his argument. Rarely have I read a book that draws on so much material that I love and presents the highlights of each work so crisply yet faithfully. We have Lewis Carroll on language, G. K. Chesterton on H. G. Wells, Lewis on Bulverism and “The Inner Ring.” We get Jonathan Haidt’s The Righteous Mind and Scott Alexander’s “Why I Can Tolerate Anything Except the Outgroup.” We hear Dorothy Sayers on whether women are humans, David Foster Wallace on grammar, and Patrick Deneen on critical thinking. Most impressively, we receive a summary of each contribution that gets straight to the heart and expresses it pithily while at the same time rendering it accurately. As such, How to Think is both a good read and a distillation of a number of other good reads. And the third is that, at least from where I’m standing, few people need to hear the challenge of How to Think more than those of us who frequent websites like this. Theologically conservative, high commitment, young(ish), literate Christians who enjoy debate and spend a lot of time online—people, that is, just like me—are exactly the sorts of people at risk of not thinking, as Jacobs defines it in this book. Currency (2017). 160 pp. $23. We frequently live in self-reinforcing bubbles; we erect strawmen; we Bulverise; we divide the world into heroes and villains, “defenders of the faith” and “repugnant cultural others”; we find it easy to react and hard to listen; we valorize and demonize; we put ourselves on the side of the angels and find it hard to see good in our out-group. (If you don’t believe me, type “Nashville Statement” into Google.) In our less self-aware moments, we even use the false “we.” We are, that is, precisely the people for whom Jacobs wrote this book, whether he meant to or not. 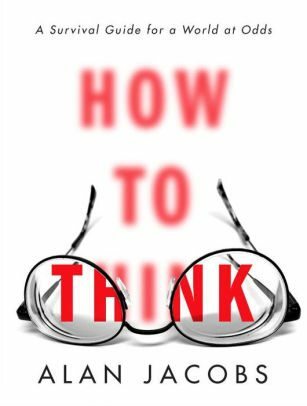 How to Think is well written, well reasoned, well presented, and well worth reading. Think about such things.